Long ago, when the technology era emerged into the golden age and brought with it all that is digital and computerized. This advancement brought in it, weaknesses and areas that required innovation and improvement. The Darkness appeared hungering for these weaknesses and assaulted large Castles, towns, and cities. The Darkness obliterated all it saw before it into oblivion, massacred all merchants, travelers, and people…..and as every single moment grew, so did it’s power grow stronger and stronger. The Darkness after revealing itself pronounces that it will conquer the whole web! It summoned dark monsters like viruses, worms, etc to unleash their wrath upon the digital world. 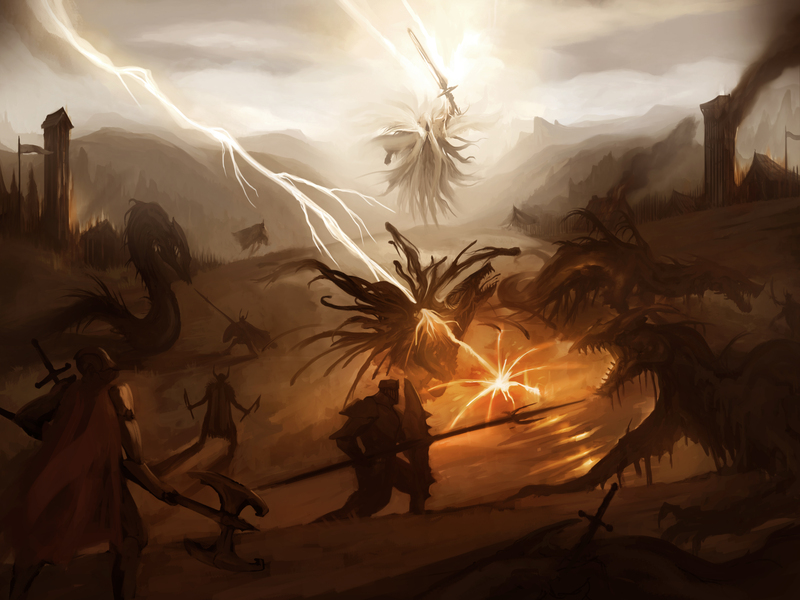 The Dark summoned monsters to bring terror on all castles, homes, and towns they pass. Assassins, thieves, and knaves all joined to help The Darkness, not necessarily because they cared about The Darkness, but for their own selfish sake. Many dark organizations came and they even warred with one another. Heroes finally emerged to battle, but these various battles were unorganized and chaotic, evil had the upper hand. One notable battle that eventually turned into a great war was The First War of Net. Heroes joined together to fight The Darkness, but most heroes were defeated. One of the few survivors, Tech King decided to form a Kingdom to improve the defense and efficiencies of this world. Tech King founded the organization, but The Darkness was relentless. Tech Kingdom and The Darkness and its various affiliated organizations battled heavily which caused another great war: The War of DDoS. The Darkness had acquired abilities to launch larger units that can shoot faster and further distances and larger siege weapons. Tech King called for a strategy meeting with his famous Tech General. Tech General had fought in dozens of battles and at times singlehandedly defeated many dark monsters and knaves. Tech General went to speak to a man known as The Phantom who was once a great general in the side of The Darkness, he was rumored to be in a nearby town. Tech General finally located The Phantom, but The Phantom declined to join wanting to use his powers no longer. Soon after Tech General left, The Darkness sent two of some of his strongest assassins to annihilate The Phantom. The Phantom sensed a dark force rivaling that of his old self. As The Phantom went outside, he noticed monsters from The Darkness unleashing havoc on his entire home land. The Phantom watched as many were slain and burned, anger rose and he finally had enough. The Phantom destroyed all the dark monsters, however was in a weakened state. Tech General made some way, but started smelling smoke and hearing screams, he looked behind him where it all came from. Tech General rushed towards the chaos which would be later known as The Massacre of Phantomlands. The Phantom was defeated in battle by the two evil assassins, but Tech General had made it in time. Soon, the battle ensued and one of the evil assassins were defeated, but Tech General wasn’t able to defeat the next one. The dark assassin took his blade and directed it towards Tech General’s head, but stopped and fell as it appeared the sword of The Phantom had felled him. Tech General and The Phantom joined forces and stopped this massacre from hurting anyone else. The Phantom took what was left of the survivors and created a force. A new group known as “Phantasmal Hackers” led by The Phantom joined in the Freelancer Regiment to help infiltrate enemy lines to defeat the dark assassins that were on the side of The Darkness and break any siege weapons if possible. The War of DDoS waged on, the Vassal Regiment built some structures to protect against the impending doom. Finally, the battle ended with the dark assassin who started this being slain by the Tech Knights. DDoS wars happen a lot and ever since this battle ended, they are all recorded as part of The Great DDoS War which is still occurring today. Tech Kingdom has fought many battles to protect against both the darkness’ curse and it’s army. Heroes have faced much evils from the darkness. The Darkness still lives on and continues it’s onslaught. Several years later, widespread attacks are sent to large web sites, the castles are bombarded by The Darkness. The Darkness even took over areas within protected towns and castles, creating hideouts for its minions. The Darkness becomes more and more powerful with each coming minute. That is why we must stand against The Darkness and protect our lands!